Across the country, from college campuses to TV stations to Washington, D.C., political tension has reached a fever pitch. Wednesday’s “Redistribution of Wealth” debate at the William Pitt Union aptly reflected the growing ideological divide in the United States today — in this case, economic disagreements between classical liberals and democratic socialists. 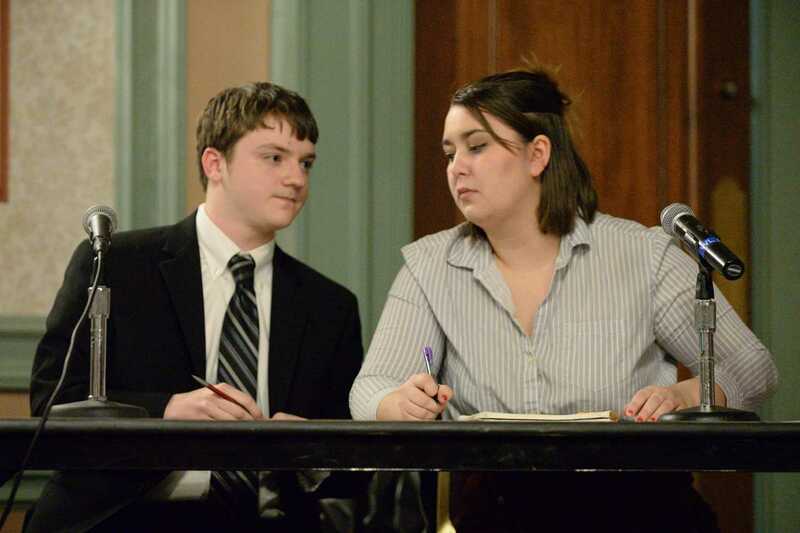 Becca Tasker and Paul Cox of the Pitt Progressives debated Katherine Ranck and Kyle Guinness, who represented Pitt Students for Liberty, a Libertarian group. Aiming to pinpoint the causes of income inequality in America and ultimately to offer solutions, the event proved to be an intense back-and-forth throughout the evening. But while the Libertarians performed strongly and presented viable policy prescriptions to address America’s lopsided wealth distribution, the Pitt Progressives often failed to measure up, falling back on arguments based in emotion and personal attacks — as many in the political arena do nowadays. They dramatically emphasized the expansion of government programs for the poor and middle class, such as health care and food stamps. Yet they never explained how large these expansions would be, nor did they detail how they would pay for these programs or their effects on the economy. By contrast, the Libertarians offered specific solutions. They called out the federal government for its inefficiency and instead favored private charities — which on average have 50 percent lower overhead costs than government programs — as a more moral and economical source for voluntary wealth redistribution. “Any private charity that was as ineffective as the government would soon be out of business,” Ranck said. This inefficiency has terrible implications for economic growth as well. As Guinness pointed out, heavy regulation and taxation — proposed by the Pitt Progressives — harms small businesses most of all. Since small businesses have created close to two-thirds of our nation’s new jobs in the last decade, a focus on taxing those businesses might actually put vulnerable members of the economy more at risk of losing their jobs. Yet the Pitt Progressives failed to respond to these points and instead doubled down on making vague statements that never amounted to any policy prescription. “Unless you can literally eat the rich, tax them until the average citizen can survive,” Tasker said. During the Q&A session afterward, Rex Lundstrom, a 20-year-old from Shadyside, asked Pitt Progressives how much wealth redistribution was too much — a fair question, since they never went into much detail regarding their policies. Admittedly, the debate’s cross-examination format may have provoked some of the verbal aggression — allowing debaters to go toe-to-toe with their opponents and audience members. But the truth is, the entirety of left-wing politics in the United States has taken on a much nastier, more aggressive approach in recent months. CNN’s town hall last Wednesday, which hosted the Florida shooting survivors in verbal combat with Sen. Marco Rubio, R-Fla., and an NRA representative on gun control, is a prime example. CNN advertised the event as a serious conversation about gun policy in America today, but it quickly devolved into a finger-pointing exercise for pro-gun control students to paint the conservatives who disagree with them on gun policy as evil. Throughout the discussion, audience members shouted down Dana Loesch — the event’s lone NRA representative — when she spoke out against gun control, calling her a “murderer” and impeding her from being able to respond to questions. Outrage is one thing, but it shouldn’t be allowed to shut down debate entirely. While this is an extreme example of left-wing bullying, this kind of tension has become commonplace in the United States’ political arena. And Wednesday’s debate at Pitt was a perfect example of the unconstructive atmosphere those on the left have created. While the Pitt Progressives obviously understand how serious a problem increasing inequality is, their approach didn’t seem to account for maintaining constructive debate. But if Progressives continue to push accusatory talking points instead of presenting real solutions, they won’t have the ability to address the problems they’re so emotionally invested in. Rather than merely shouting down the opposition, liberals should channel their outrage into constructing actual policy and working with Republicans to actually make a difference. Similarly, if Pitt Progressives wants to grow its member base and persuade people to join its cause, the group should emulate the Libertarians’ approach to the debate — using facts, logic and a level temper to dictate their arguments. If liberals can’t improve, they’re sure to come up short everywhere, from the William Pitt Union to the White House. Neena primarily writes about politics and local issues for The Pitt News. Write to Neena at nnh7@pitt.edu.